This would be just the right cake to serve during the Christmas and Thanksgiving holiday season. This will definitely satify your egg nog lovers. Preheat oven to 350°F. 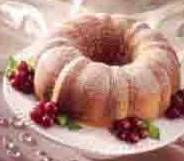 In large mixing bowl, combine cake mix, pudding mix, egg nog and oil; beat at low speed of electric mixer until moistened. Add eggs and nutmeg; beat at medium-high speed 4 minutes. Pour into greased and floured 10-inch fluted or tube pan. Bake 40 to 45 minutes or until wooden pick inserted near center comes out clean. Cool 10 minutes; remove from pan. Cool completely. Sprinkle with powdered sugar, if desired.